I had just gotten a new job and my car broke down. I felt like I needed to replace it quickly and was running out of options. I knew a fella from the golf course I frequented who worked at a car dealership. I ended up visiting him there – and quickly fell in love with a nice, used Volkswagen Jetta. I was sold and without much looking around, I signed up for a 5-year debt and interest commitment. It still remains one of my biggest financial regrets. I mean, the cost of the car was about 2/3 of what I was making every year! As Dave Ramsey is known for saying, sometimes we need to pay a lot of “stupid tax” before we wise up. Our friends at Student Loan Hero conducted a survey of 1,000 folks and asked them what were some of their biggest financial regrets over the past 12 months. Given these regrets weren’t over a lifetime – but a one-year period – many of the answers seem common. Many of us regret not saving enough, and spending on items we didn’t need. One item I found encouraging was that not many regretted any “big-ticket” purchases (home, car, ie) which they couldn’t afford. But, perhaps there weren’t opportunities to purchase these items (for example, if they were just-graduated, broke college students). But many of us know what we ought to be doing – but don’t quite get it done. As I’ve gotten older, I have certainly cut back on the wants. But I still struggle with saving enough and applying money towards some of our debt (student loan + home). What are some of your regrets? I’m curious to know what are some of your financial decisions you wish you could have back? 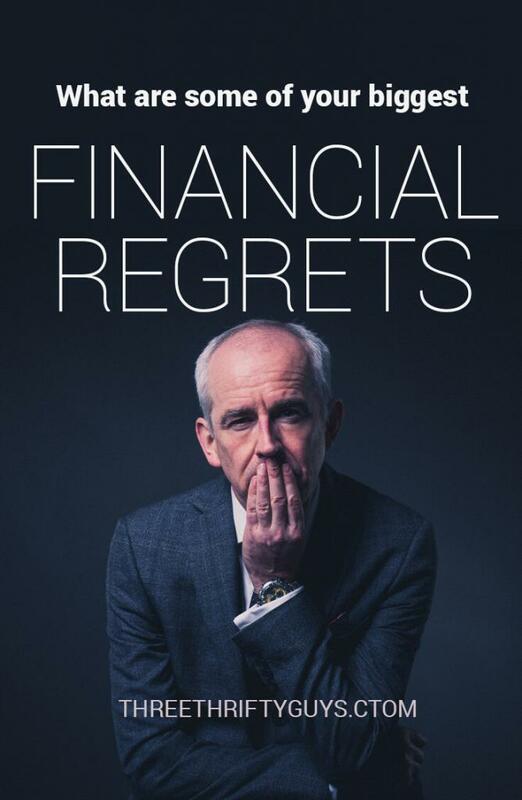 What regrets do you have looking back at life in terms of money? Not investing earlier. Gosh, if I had only knew the returns and more about compound interest and opted to invest rather than spend. Built a business earlier / focused on assets. Owning assets and building something of your own can really get you ahead in the ballgame. While I had (have) a lot of ideas, some of my execution was missing, so I never got a jump on business dealings, which could have paid dividends. Taking out student loans without much thought / planning about payoff. I admit I was pretty naive when I entered college and signed up for all those student loans. While I’ve been able to pay them off since – they were a burden when I was in the midst of eliminating the balance. Be interested to hear about some of your biggest financial regrets. Don’t regret spending so much on your cell phone bill. See how Matthew and his wife are saving more on their cell phone bills. Interesting study! My biggest financial regret is buying a house I couldn’t afford and then trying to rent it out (to the tenants from hell)… You can read about my experience here! Not investing earlier especially during the booming years when the economy was great. Didn’t understand it and by the time we were building the business and then collapsing during the recession, it was a case of too little, too late. Now after years of working hard and sacrificing, we are stable, but we will never get back the years we lost, especially for my poor husband who is 15 years older than me, so a full retirement will never be in the picture. I just keep doing the best we can with what we’ve got. I can sympathize with you Marleigh as I feel we could have done better, sooner too. Thankfully can always make changes now and do our best from here. To echo XRayvsn…..the choice of marriage partner is (IMO) THE most important financial decision you will ever make. Not surprising that not saving enough is number 1. Even for individuals who did start saving early, we’re left to wonder what our accounts would look like if we just saved a little more. The power of compound interest works wonders over the years! Oh yeah. If only I had started w/ my first job.. I launched my blog with a series called “I Made Every Mistake In the Book.”. It was a 5 post series if that gives you an idea of how many mistakes I made. Of those mistakes the biggest financially and emotionally was choosing the absolute worst partner to marry (it was an arranged marriage and sort of felt familial obligations). Wow, yeah, divorce would be terrible to go through. Probably top 5 in one of the more important decisions we have to make (who we marry). I can 100% agree with you on not starting early enough. I also regret not paying attention to my student loans. At least now I have a plan and am working on getting rid of them now- better late than never, I suppose! :) Too wise, too late sometimes.